Struggling to decide on your custom furniture options? Or maybe you simply don’t understand what an option is? With made to order Amish furniture, you have no shortage of options. 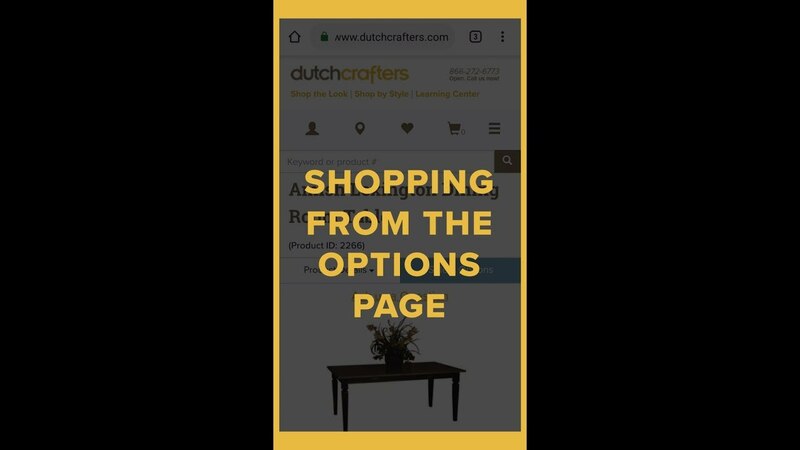 Here’s your guide to shopping from the dutchcrafters.com options pages on mobile devices. Visit a DutchCrafters Options Page like (https://www.dutchcrafters.com/productoption.aspx?pid=42998&qty=1) and follow along to choose exactly what you want from our custom options. DutchCrafters options pages are full of custom options for your furniture. Pick a wood finish and upholstery, select a size, and much more on almost every product in our lineup. And if you can’t find what you want in our standard options, you can always talk to a furniture specialist at 866-272-6773 and request a customization from our woodworkers, who are happy to make changes on request. Once you’ve decided to make a piece part of your home, it’s time to select your options! The options available on this page will vary from product to product. Questions about the options? Click the question mark for the Option Help window, with original videos and information to help you make your decision. We pride ourselves in being some of the foremost experts in Amish furniture on the web, with over 15 years of experience, and this is one way we want to share our knowledge with you. When you feel properly informed on the option, simply click off the window to return to options. Click any of the gray bars to open the section’s accompanying options list. Click on your preference and the bar will turn green and close, allowing you to move on to the next option list. Your choices will immediately be reflected in the final price at the bottom of the page. After selecting a wood type, you’ll have an opportunity to see samples of each finish in the sample selector. Click the magnifying glass to see a larger image. We can’t guarantee that the color of an image on-screen is an exact representation of the color of the finish in your home, so we highly recommend you order samples. We’ll be happy to send you paint, stain, and fabric samples for a small, refundable deposit. After closing out of the pop-up image, clicking on the name or picture selects the option. If any questions arise while selecting options that the option help window doesn’t answer, please call a DutchCrafters Furniture Specialist. The furniture specialist will be happy to help you with any custom requests if our options just don’t quite fit your needs. Many of our Amish Woodworkers are happy to make customizations; all you have to do is ask! We can get your order started for just 30% down payment on qualifying orders! After adding the piece to your cart, you’re ready to begin checkout. Happy shopping!